Yadier Molina’s deep drive in the ninth inning hit the warning track and bounced off the second wall in left field, which should have been called a ground-rule double. Instead of returning to third, the umpires allowed Matt Carpenter to score from first base ruling Cincinnati took too long to challenge the call. All four umpires missed the call and Reds manager Bryan Price must notify the umpires immediately after the game that they want a challenge. The umpires waited and when no sort of contact was made, they exited the field. 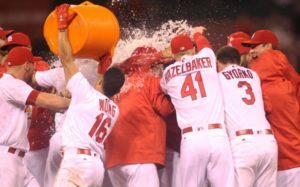 The 4-3 win helped the Cardinals keep pace in the Wild Card. They continue to trail the Giants by one game. San Francisco beat the Rockies 7-2.